Live demonstration of combat vehicles at Defexpo 2018 in Chennai. One of the highlights from last month’s DEFEXPO 2018–the massive arms show organized by the Indian government and held every two years–was a public demonstration to showcase locally made armored vehicles. Without any doubt, the lone Arjun Mk. II eclipsed the rest of the participants, including an impressive wheeled APC and a stationary howitzer left in the background. 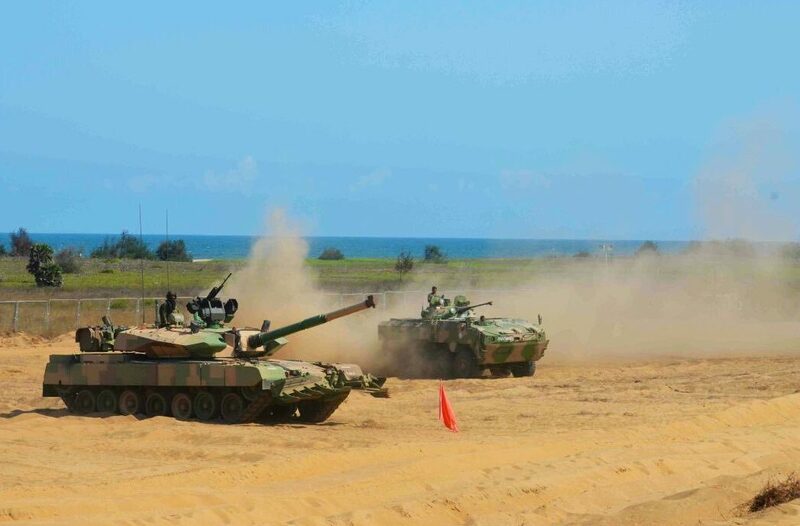 The 68 ton MBT is an upgraded variant of the original Arjun that only entered service in 2011. A mere 124 Arjun Mk. I’s, which are patterned after the Leopard 2, are deployed with the Indian Army. Its sibling the Arjun Mk. II, on the other hand, isn’t even in low-rate production. How come? The Arjun’s origins dates back to 1974 when the Indian military wanted a new main battle tank superior to the licensed Vijayanta that was based on a British design. But a protracted development process guided by the DRDO and the army’s own preference for Soviet T-55’s and T-72’s made the Arjun a dark horse. Despite endless field trials where it showed its mettle, erratic budgeting and procurement decisions sunk its prospects. The Arjun’s reputation sank even lower when huge orders of RussianT-90S tanks were made in the 2000s. Shortly after the last batch of Arjun Mk. I’s were delivered in 2011 the army requested specific improvements on the current model when quality control issues became too numerous to ignore. The DRDO quickly redesigned the Arjun, installing spaced panels on its turret and reactive plates over its glacis for better protection, thereby hardening its already impressive Kanchan ceramic armor. A new fire control system coupled with thermal sights were installed and a remote weapon station armed with an NSV machine gun was placed in front of the gunner’s hatch. More than a hundred other fixes were made to the new variant in the span of just two years. The fastest way to tell the Arjun Mk. I and Mk. II apart are their turrets. The latter has sharp angles rather than a box shape. The few Arjun Mk. II’s produced by the DRDO and OFB had serrated mine plows attached to the front of the hull. But the Indian Army were still displeased and judged its gross weight unsuitable for the local geography. Faults with its 120mm rifled main gun were also exposed as it couldn’t launch anti-tank missiles. The army and the DRDO reached a compromise by allowing either a locally made missile or the Israeli LAHAT to be used on the Arjun Mk. II’s main gun. The result of this constant tug-of-war over specifications is the Arjun Mk. II won’t enter mass-production until the 2020s are underway. It isn’t surprising the Indian Army ordered 464 new T-90MS tanks from Russia in 2016 and published the basic requirements for the Future Ready Combat Vehicle (FRCV) in the same year. These decisions cast serious doubt on whether the Arjun Mk. II is worth considering when it no longer has a place in the military’s evolving land warfare doctrine. It can be argued the Arjun Mk. II is on par with the K2 Black Panther and the Leopard 2A7 but this does little to improve its chances. Since the Indian Army loves its Russian armor so much, it’s obvious it doesn’t want an MBT built to different standards. Never mind if the Arjun embodies the principles of “Make in India.” Aside from its engine, transmission, and an unnamed fire control system, the Arjun Mk. II’s assembly and supply chain is covered by local firms. At the rate it’s going the tank’s inevitable retirement can only be reversed by two far-fetched possibilities. Either the Arjun Mk. II is displayed abroad to entice potential customers or it undergoes another series of improvement that result in…the Arjun Mk. III. The first option isn’t as difficult as it may appear since India does have defense/military exports that earn a modest amount of revenue. For best results, the Arjun Mk. II can be positioned as a third-generation MBT with bespoke features. Its appeal may stem from the dearth of genuine Leopard 2’s, whose stocks are dwindling from persistent demand. A $4 million Arjun Mk. II is a reasonable enough alternative to wasting money on Cold War vintage Chieftains, Leopards and Pattons. Rebuilding the Arjun is a possibility that might be unavoidable. As automation and defensive countermeasures are pushing rapid advances in armor technology, perhaps making the Arjun Mk. II on par with the Merkava IV or the T-14 Armata is the DRDO’s next best chance to prolong the Arjun’s career. When Turkey’s Otokar unveiled an Altay tank–another troubled armor program–equipped for urban combat in 2017, this might have created a niche the Arjun Mk. II (or its successors) can compete in. But the lack of attention directed at the Arjun and its travails does reveal a disappointing truth. Aside from Indian “defense industry” publications, nobody cares much about this impressive tank from South Asia. Not even the army it was made for.